The sun is out, the weather is starting to feel like summer, and the kayak launches are getting crowded. For Glenn Madden, it’s nothing new. 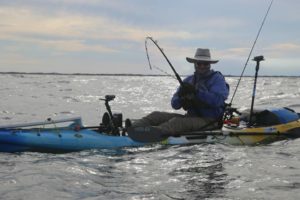 He’s been kayak fishing so long that the ebb and flow of new anglers in and out of the sport is an everyday occurrence. As we approach the summer busy-boat season, we wanted to chat with Glenn about his OG status (OG is Original Gangsta for the slang challenged), how the sport has changed, and what he recommends for new kayak anglers. Q: In your opinion, what is the biggest difference from when you first started compared to someone picking the sport of kayak fishing today? A: When I started out, there wasn’t much media available for those wanting to fish from a kayak – especially if you wanted to venture offshore the way I did. Texas Kayak Fisherman was a very helpful resource with areas dedicated to beginners, rigging boats, and each type of fishing from kayaks. Fishing in lakes and bays had already taken off, and guys were actively working to solve equipment challenges and creating their own fixes to the problems encountered. 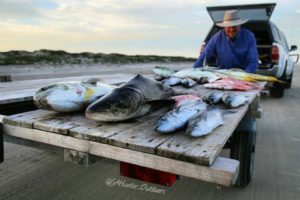 The resources for fishing offshore was limited to what the Houston-area guys did, just beyond the surf where they would anchor up and fish for reds and sharks. Since I was wanting to target pelagic species, I was forced to develop my own style and equipment/rigging system that would work in that unique environment. It was fun for me, because I enjoyed tinkering and figuring out what worked best for the issues I faced on the kayak. Now the sport has grown quite a bit many companies and groups have taken directions similar to YakGear and come around to help new kayak fishermen organize their boats quickly and easily to get out on the water and have success catching fish. Q: In your opinion, how has social media impacted kayak fishing? A: Social media has been a major driving force in getting the word out that kayaks provide an affordable and very successful way to catch fish. I catch more fish now than I ever did when I fished from a powerboat. Facebook and other pages allow new folks to target the information they’re looking for and the advice available comes from a wide variety of people, many of whom are eager to share not only how they do things in the kayak. Q: In terms of gear, helps or hinders kayak anglers? A: The most important piece of safety gear is the PFD, but only if it is worn while you’re on the water. Other safety equipment is also important (signal mirror, whistle, light, VHF, leaving a fishing plan with a friend) but they are useless if you get separated from your kayak and drown. Wear the PFD – that’s easily your most important piece of gear. Some people want to pack too much on their little plastic boats, to cover every possible scenario. If you overdo it, the fun can be sucked out of what should probably be a pretty simple activity. When you are starting out seek out others who have been fishing that way for a while and ask: Why do you pack the equipment that you take, and why? If you run into experienced folks on the water it’s even better. They will frequently demonstrate what they do and why. This can really shorten your learning curve and prevent you from spending money on gear that ends up somewhere in the back of the garage gathering dust. Q: What is your advice to someone who is just starting out? A: There are a couple of things I recommend to new folks: First, it doesn’t matter what kayak you start with, so long as it is watertight. Get on the water and have some fun, and as you do that you will begin to realize what you want to look for in a more specialized kayak. When you run into others on the shore, talk to them, and you may get an offer to paddle their boat and see how you like it. Better yet, attend a demo day in your area and try out a bunch of kayaks. Second, new folks should read. Look at the blogs on many of the kayak related sites, TKF, kayak groups on Facebook, and search for helpful videos on YouTube. Then connect with locals who share the same fishing style by using the same resources mentioned previously. Some of the experienced fishermen/women enjoy their solitude on the water, but are still willing to help out new folks as they try to prepare for success on the water. Overall the kayak community is a friendly bunch, and most are easy to approach and talk to. Some of us are visible to a wide audience, and to help the largest audience possible, we try to make videos to answer common questions. On my YouTube channel there is a section on “how to” that answers some of the common questions I get.